This diagnosis has jarred me, but it will not knock me down. 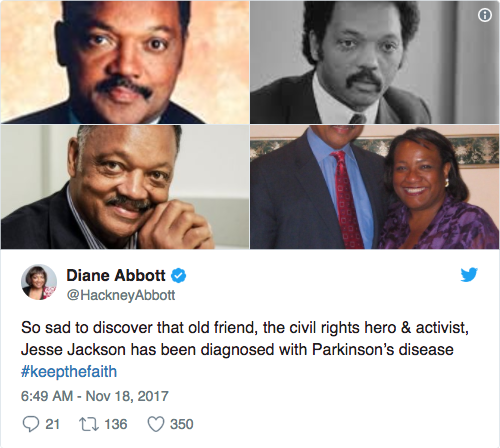 Jesse Jackson, the prominent American politician and civil rights leader, has vowed to use his voice to find a cure for Parkinson’s. Jackson announced last week that he had been diagnosed with Parkinson’s, and said on Monday that his condition was “not a stop sign, but a warning light that I must make lifestyle changes”. The civil rights activist, who worked closely with Martin Luther King Jr, promised he would not allow Parkinson’s to hinder his work. Writing in US newspaper the Chicago Sun Times on Monday, he said: “I’ll continue to try to instil hope where there is despair, to expand our democracy, to comfort the stranger, to free innocent prisoners across the world. This diagnosis has jarred me, but it will not knock me down. He has since been flooded with tributes from supporters around the world. William Egerton reminded Jackson that he wasn’t alone, and encouraged him to keep fighting. British member of parliament Diane Abbott offered her tribute to an “old friend”. Other users shared personal stories about how the condition has affected their lives and those of their friends and family. Born in South Carolina, US, Jackson’s political career began in the 1960s when he started to work for Martin Luther King Jr. He quickly moved up the ranks of Dr King’s movement, becoming a prominent civil rights leader. Jackson has continued to play a significant role in US politics over the subsequent 50 years, twice running for the Democratic Party presidential nomination. Despite being unsuccessful in his campaigns, Jackson has been attributed with helping to lay the foundations for Barack Obama’s election victory in 2009. 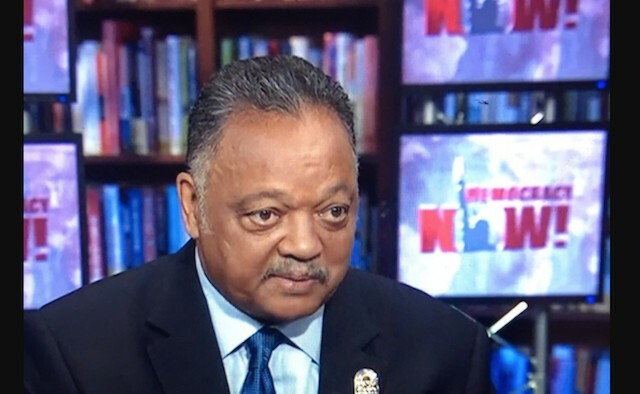 What an important opportunity for Reverend Jackson to broaden his civil rights and advocacy role. Hopefully he will commit to physical AND speech therapy so that his voice is the testimony of what medication and non-pharmaceutical treatments can offer individuals with PD, and that he will show others that he is not “suffering” with PD but rather living well.